My dad has this weird obsession. I mean, it’s not totally weird and something my brother and I probably started when we were younger. He likes to collect things. His two obsessions now are Diecast Dirt Late Model Racecars and Chicago White Sox Bobbleheads. The last couple of years, my dad has stalked the White Sox schedule looking for bobblehead giveaways. He has a couple shelves full of them and the collection keeps growing. It’s not a bad thing. He enjoys going to games anyway and this gives him more of a reason to try and get one of us to go along with him. I know what you’re thinking, what does this have to do with the Kalamazoo Growlers….or are you thinking that because I haven’t even mentioned the Growlers yet? Well, now you are and yes, this story does have a Growlers connection. 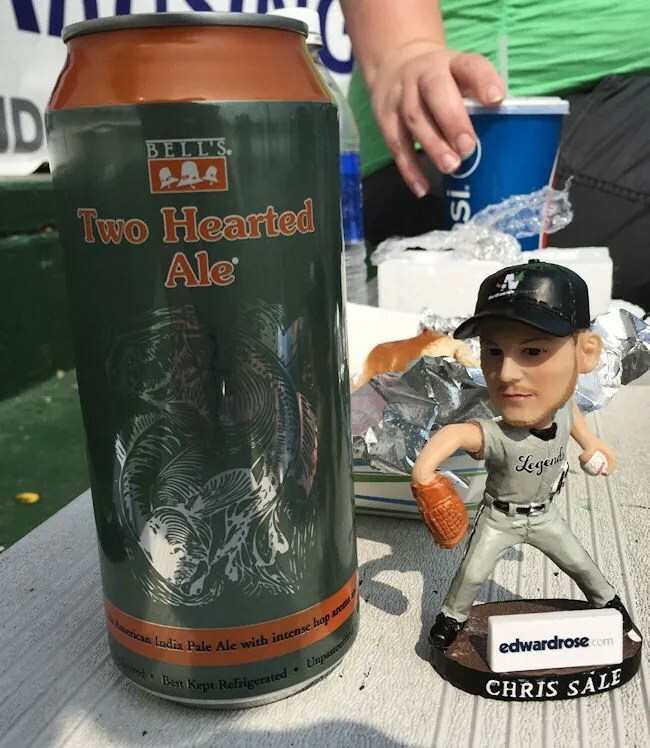 Last weekend, the Growlers were giving away Chris Sale bobbleheads. If you’re not a baseball fan, Chris Sale is a pitcher (and a pretty damn good one) for the Chicago White Sox. 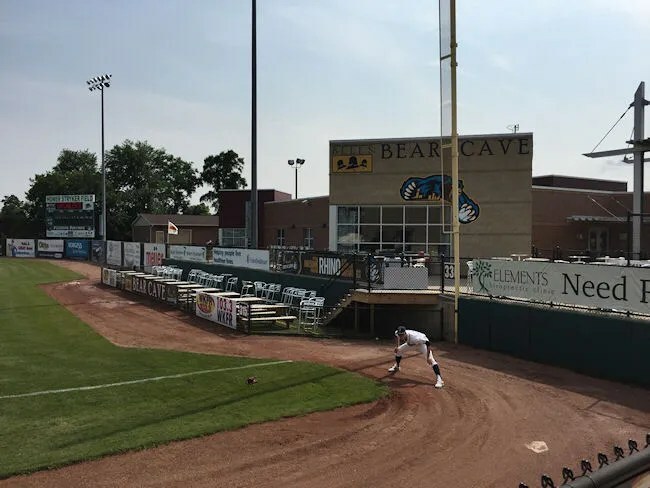 He also played in the Northwoods League for the LaCrosse Loggers in 2008, so for some reason, the Growlers were giving away bobbleheads at the game last Friday. 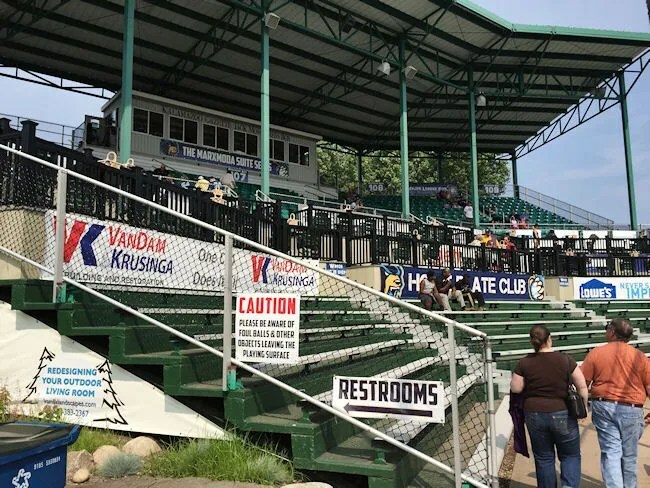 J and I went to a game at Homer Stryker Field back in 2010 when the Kalamazoo Kings of the Frontier League called the stadium home. 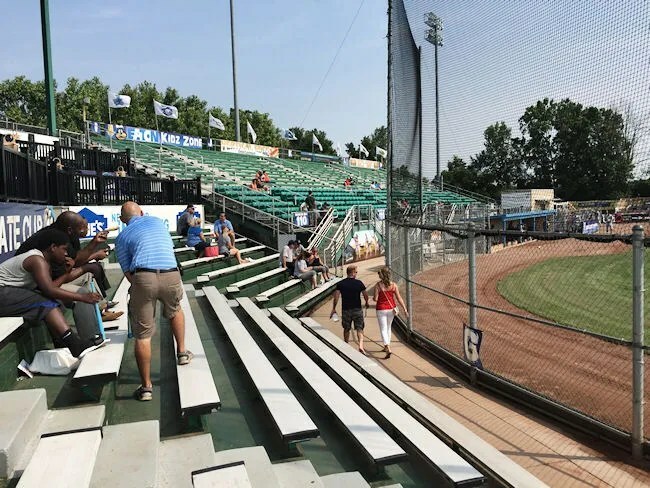 The baseball wasn’t great, but we enjoyed the intimate atmosphere of the stadium and were looking forward to the Field’s new life as home to the Growlers. J had picked up some vouchers from work for free general admission tickets. We had four people instead of the usual three because I had a friend in town visiting and he wanted to check out a baseball game. 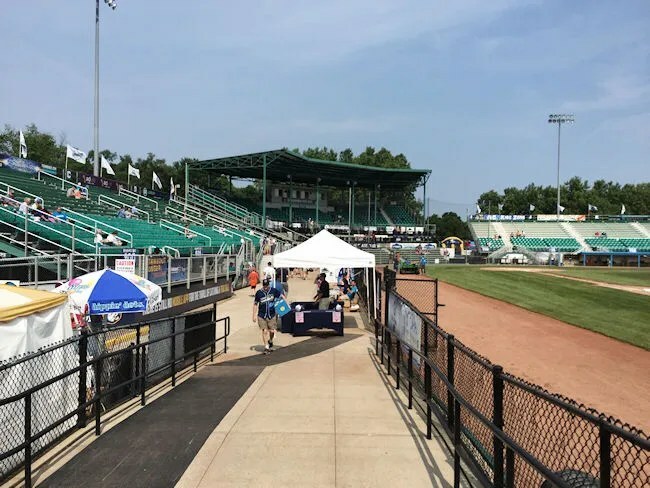 Granted, he was hoping to go to a Midwest League game somewhere, but we just wanted to spend our Independence Day weekend close to home and as stress free as possible. 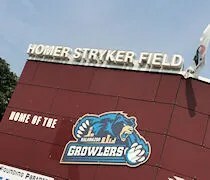 A lot of the changes at Homer Stryker Field since the Growlers came in are cosmetic. The layout of the field and seating areas hasn’t changed. 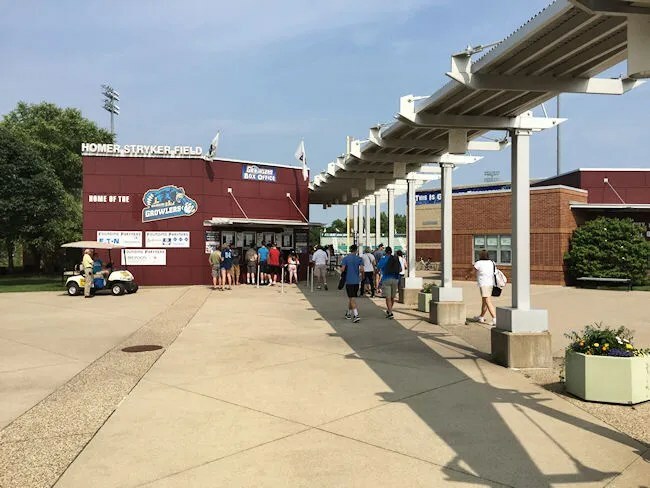 The big noticeable things are the Miller Lite Party Zone in left field, the Bell’s Bear Cave private group party area and the Home Plate Club which is situated between the General Admission seating and the Suite/Reserved sections of the main grandstand. Both the Miller Lite Party Zone and Bell’s Bear Cave have seating right down on the warning track for what I assume is a pretty great view of the game. There’s also other perks with each section which includes unlimited food and some drinks as well. The Home Plate Club is another very cool section of the ballpark. It features tables surrounded by old seats from Baltimore’s Camden Yards plus wait service, exclusive food options, and growler delivery right to the tables. Unfortunately, like the Bear Cave, these don’t appear to be tickets you can buy on a single game purchase. They’re meant for businesses and groups to purchase on a half or full season option. With all that cool stuff, we decided to just stick to our free general admission tickets. We got the bobblehead as we walked in and made our way to the seating area. There are two huge sets of bleachers on either side of the main grand stand. GA seats are at the bottom of the grand stand or on the tops of the bleachers. Any seat outside of the reserved section in the main grand stand is open to the elements. 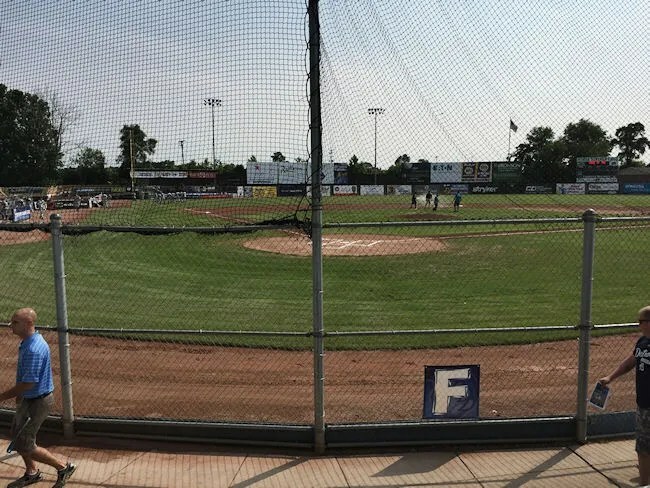 The big downside to games at Homer Stryker is the lack of shade. It wasn’t an overly hot day, but we sat behind home plate in the GA grand stand section and that sun just beats down on you the whole time. Cover for the seating areas would be a major expense, but it’s really a big thing the park is missing. Of course we’re not going to go to a game without grabbing some dinner. There’s a concession stand located underneath the first base side bleachers. 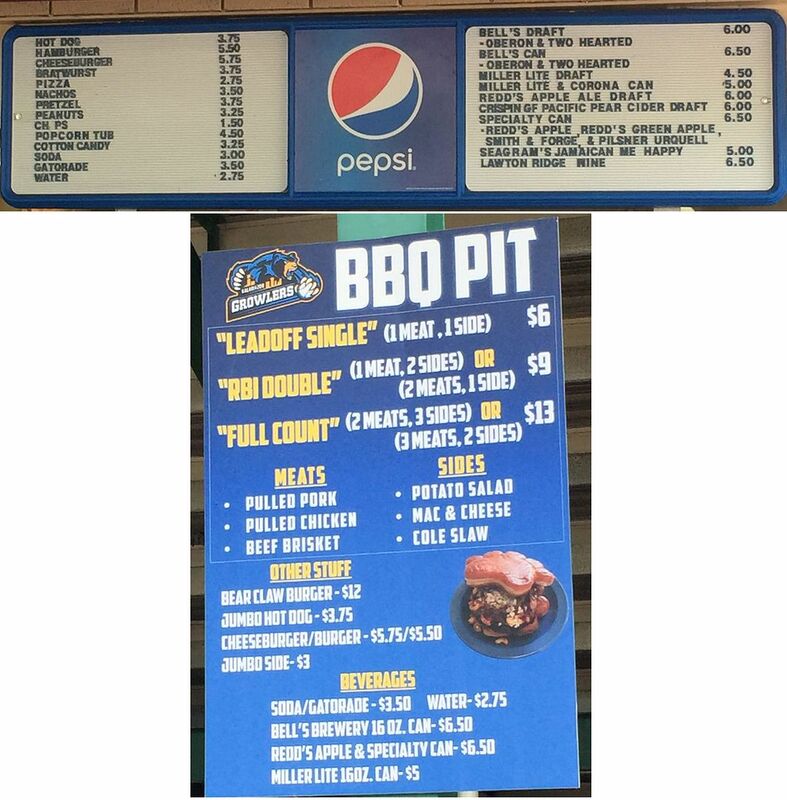 They have a lot of the typical ballpark food…you know…hot dogs, hamburgers, pizza, nachos, etc. They also have Pepsi products and a decent beer selection including a couple Bell’s offerings. At the time, we didn’t realize this wasn’t the only concession stand….more on that in a second. 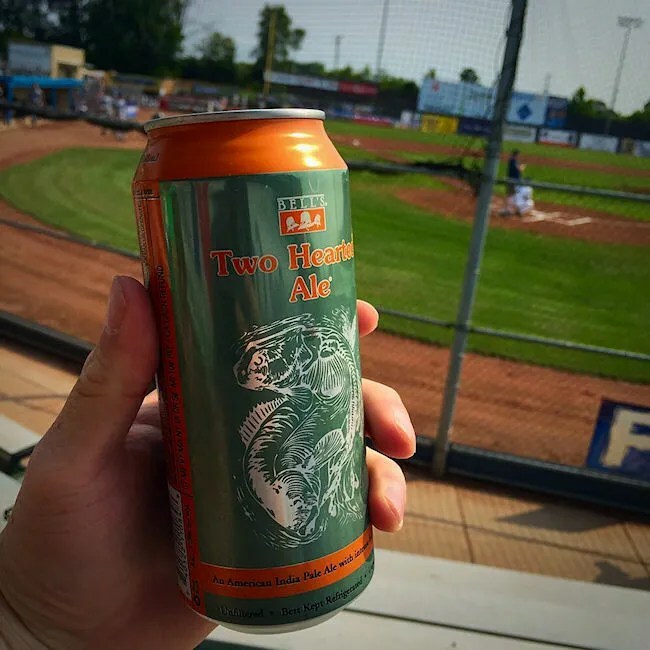 I grabbed a cheeseburger while J got a slice of cheese pizza and a soft pretzel for L. We added on a bottle of water for both L and J. I got a can of Two Hearted Ale to drink….much better than the LaBatt I had to drink at C. O. Brown Stadium the previous week. The stuff we ordered at this concession stand was ballpark food. It was fine. Nothing great. Just good, filling, a little over-priced ballpark food. At some point, j wondered out loud how we missed the Bear Claw Burger. I totally forgot about that and wondered if there was another stand somewhere. J wanted to get some cotton candy for L, so I said I would go on an adventure. After getting her cotton candy, I walked around the corner to go completely behind the first base bleachers…and there was another, much better food option. The BBQ Pit had the Bear Claw Burger we were wanting to try, but it also had pulled pork, pulled chicken, and beef brisket. We both wish we would have seen this sooner as we wouldn’t have wasted our money on a cheeseburger and a slice of pizza. I wasn’t super hungry at this point, but I wanted to try the Bear Claw Burger. There were three adults in our group. I figured between the three of us, we’d take care of it, so I ordered it and a Mt. Dew. The burger is $12 and it’s meant to share…I mean, I could have eaten it all myself…but…..I knew I shouldn’t. This delicious, crazy creation uses unglazed Sweetwaters bear claws in the place of bread. 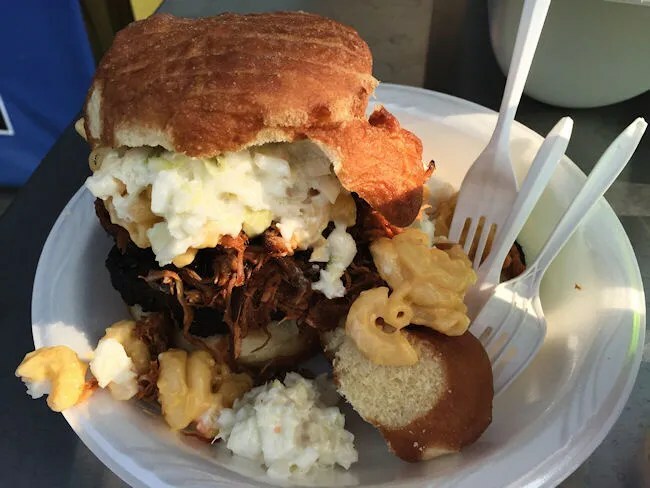 In between the pastries is two hamburger patties, pulled pork, mac ‘n cheese, and a creamy cole slaw. It’s definitely a forkable sandwich…I wouldn’t suggest trying to pick it up. 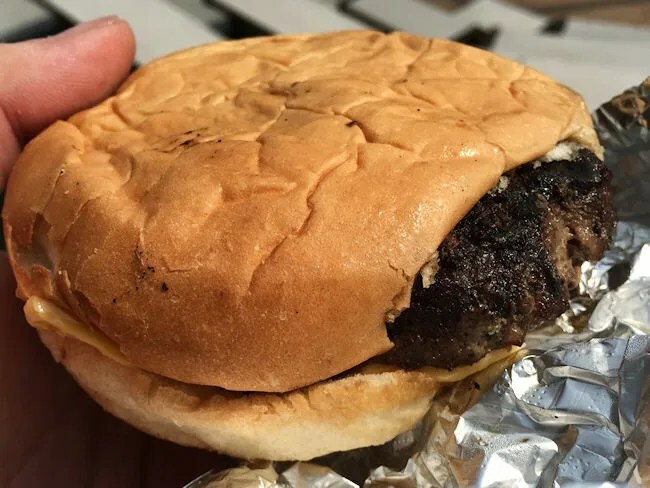 The burgers were cooked almost to hockey puck texture, but that wasn’t really a big deal. The toppings are what really made this sandwich outstanding. The pulled pork was tender and soaking in a sweet BBQ sauce. The mac ‘n cheese was swimming in a thick, creamy cheese sauce. The cole slaw….wasn’t really my thing…because I don’t like cole slaw anyway, so I pushed it off to the side to get my fork in to everything else. 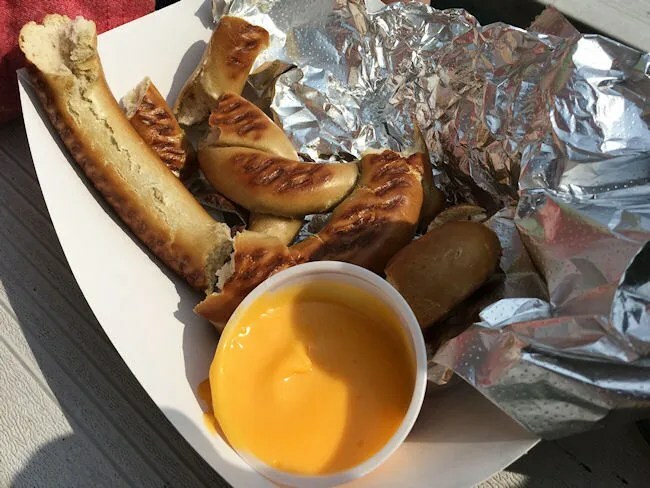 All said, this sandwich isn’t so far out there that you look at it and think, “why would anyone eat this?”, but it’s crazy enough that you just have to try it if you’re at a Growlers game. All three of us enjoyed the sandwich and I was super glad I found it before we left for the night. All said, our first trip to see the Kalamazoo Growlers was a nice family outing. Even without paying for tickets, we still ended up dropping about $60 on food and drinks, but that’s not all that bad for a baseball game. Things have definitely changed since the Kings disbanded and the Growlers moved in. This isn’t professional baseball, but it’s the atmosphere at the park is what makes these great games to go to.